Busy week ahead? This week’s campaigns will give you ideas to get a jump on your next project. Let’s cut to the chase. Admit it: You love taking online quizzes to find out which Harry Potter character you are, or where you should go on a dream vacation. Why not create a quiz of your own for your next campaign? 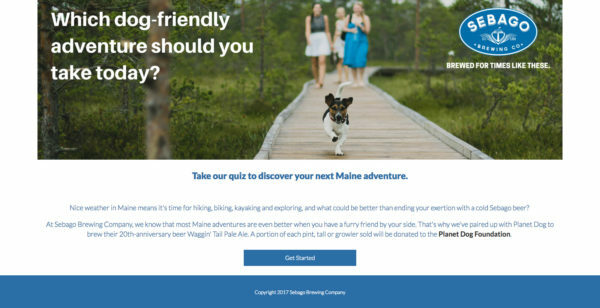 I LOVE the “Discover your Next Dog-Friendly Maine Adventure” quiz Sebago Brewing Company created. Users answer questions about their dogs, about their adventure style and their location. The results include an idea for an adventure and a nearby brewery location the quiz-taker can go to enjoy a Sebago beer. Father’s Day is Sunday; have you created a campaign yet? It’s not too late! 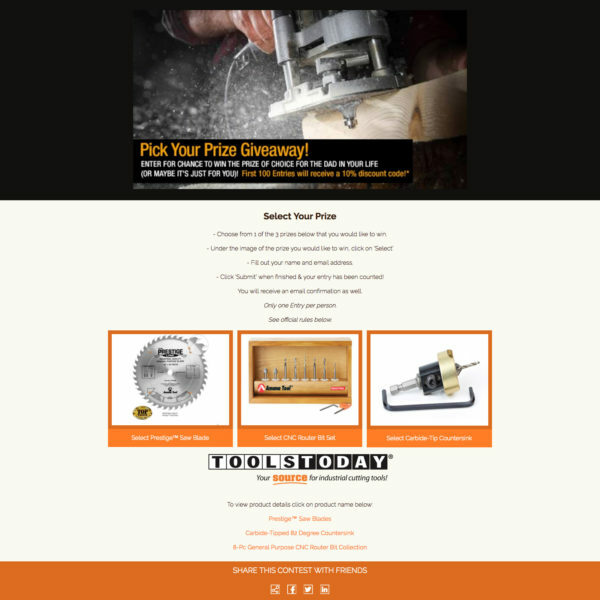 Check out ToolsToday’s Father’s Day Pick Your Prize contest. Folks are encouraged to choose a gift they’d like to win for a dad in their life, or the prize they want for themselves. They also use our email autoresponder feature to send an entry confirmation via email, with the first 100 entrants receiving a little bonus of a 10% discount. To build your own, use our Pick a Prize template. With school letting out for the summer, parents are looking for ways to keep their kiddos occupied for the next few months. 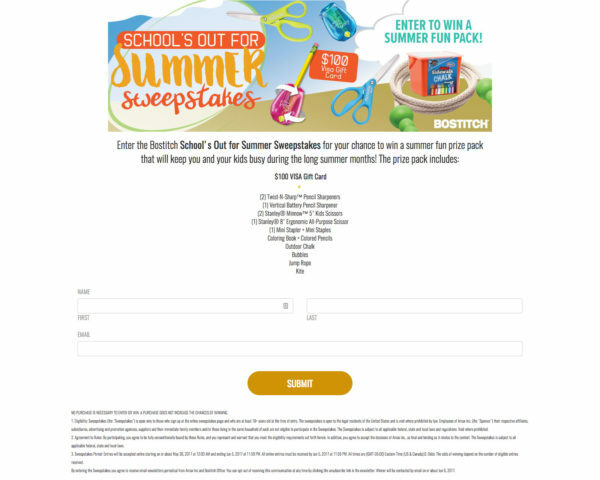 Bostitch’s “School’s Out for Summer Sweepstakes” campaign definitely deserves an A+. Not only did they create an awesome prize pack both kids and parents will love, but their entry form only takes a few seconds to fill out because its consists of two fields, name and email address. A great reminder to keep things simple.